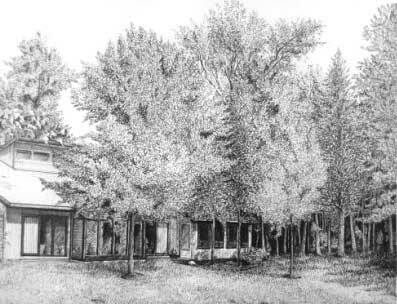 In this view of the “Gilbert Home”, you can see the many different elements of the scene as it pertains to the trees. The property is loaded with them and this is one of the main reasons I agreed to do this drawing. 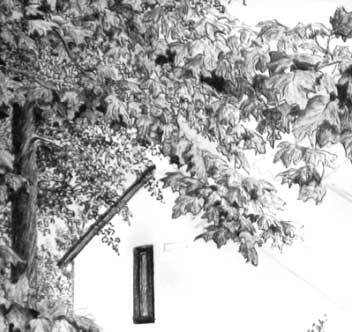 This is a crop close-up view of the finished drawing. Let’s break it down into the three main elements of trees that we are dealing with. Second, is the mid-ground trees. These trees are seen but, not as clearly as those in the foreground. This means that we don’t draw them as large or in as much detail as the foreground trees. Let’s start the mid-ground trees. The first one I started is the one just to the viewer’s right of the large foreground tree. You can see that I started putting in the indications of this tree trunk with pretty light tones using vertical lines running in the direction of growth for this tree. I use my FINE point pen to do this with, as I said, with very light pressure. 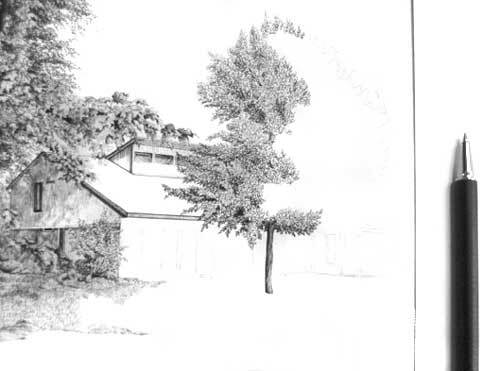 Then, using the same FINE point pen, begin to layer over the top of your first tone lines in the mid-ground tree trunk with lines that start from the shaded side and roll out toward the lighted side of the tree. Place the pen tip at the shaded side and roll it toward the lighted side and lift as you move. This creates a darker edge on the shaded side of the tree and a lighter tone side giving the tree depth in the viewer’s eyes. You can see this in the next picture. This work is done actually very quickly. There is no need to try to define too heavily the bark lines as this tree is too far outside of the viewer’s visual depth of field. That’s about it for the mid-ground trees and foliage. Next we will tackle the distant trees and foliage. 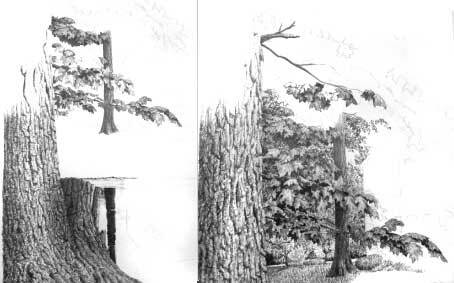 As I have stated the before, the distant trees are drawn with only the smallest amount of detail and line work. 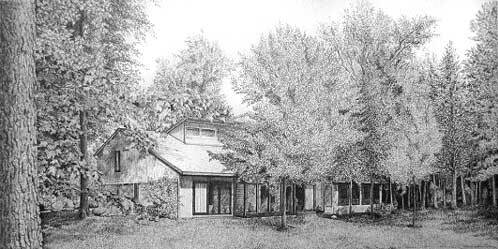 Most often I use a style of stippling and short dashed lines to indicate leaf and foliage work. 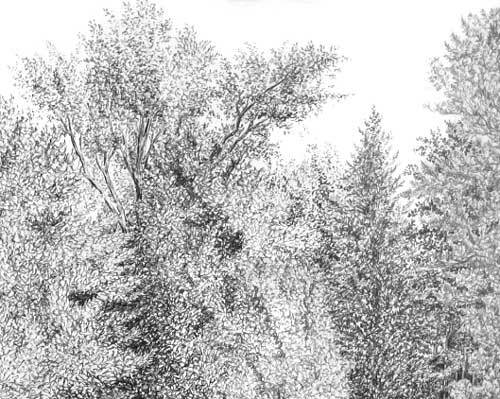 Stippling, as it pertains to Ball Point Pen work, is the use of dots to produce a form on paper that is recognizable by the viewer as a specific subject in the drawing. I use these series of dots in layers to yield tone and depth. I also us a form of dashed lines or squiggles that could almost be called “scratch work”. I do this work very quickly and without attention to a set pattern or design as I want them to appear more natural when finished and not like a type-writer or printer work. 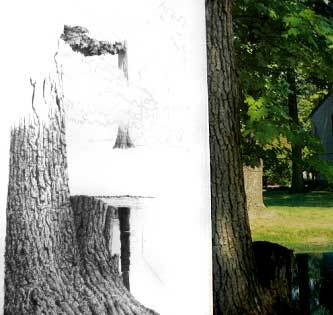 Look at the cropped image from the mid-ground and distant section of trees from the finished drawing. If you compare the two areas you can see that the mid-ground trees foliage areas, while much smaller in detail outline than the foreground trees foliage areas, you can still discern the leaf patterns that make up the leaf clumps from the branch and limbs. Now look at the distant tree leaf patterns. After close consideration, you see that suggestion of leaf patterns and clumps are only made up of the dashes/scribbles and dots that I have mentioned before here. Look at this close up cropped image from the previous image. You can see the dot and scribble work more easily. Note that I can use these same techniques for leaf work tree sections and for Pine or needle like tree areas. I merely work the scratches or scribbles in a closer pattern that more closely follows the growth pattern of the pine trees in the scene. Those trees also appear much darker as they are behind the leaf type trees and are shaded. I will layer the scratches and scribbles until I get the tone value that I want in the scene. The dot or scratch work for the most distant tree indications are very sparsely spaced giving the appearance that you can just barely make them out. More white paper seen, equals more distance.
! Remember for the distant and mid-ground work almost all of it is done with the FINE point pen. Keep the tip wiped clean to guard against accidental ink placement. I think this about wraps this one up. As always, if you have any specific questions, please feel free to email me directly, and remember, Keep On Creating! 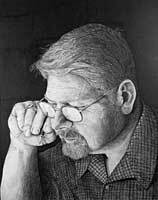 Awesome pen work Vincent Whitehead, the best I’ve seen. I especially appreciate your comment about gaining respect for, God’s creation. 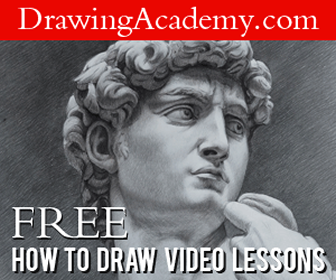 Wonderful detail and control of a pen, I thoroughly enjoyed it.